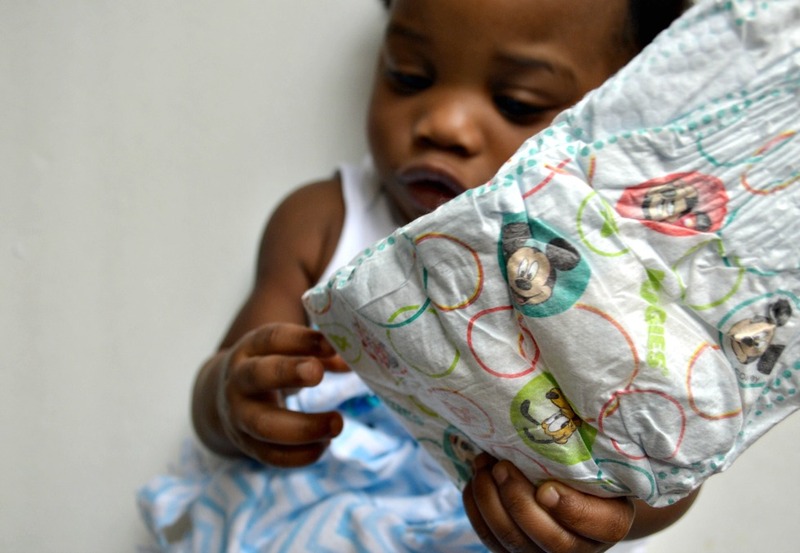 Moms of busy infants, how are diaper changes going for you? Things have gone crazy when diaper change time comes around here. My ten-month-old is not here for pausing his day to change his diaper. It like an epic battle when I lay him down for a changing. He just wants to move around, wiggle himself free and be able to “walk” around and continue his explorations. 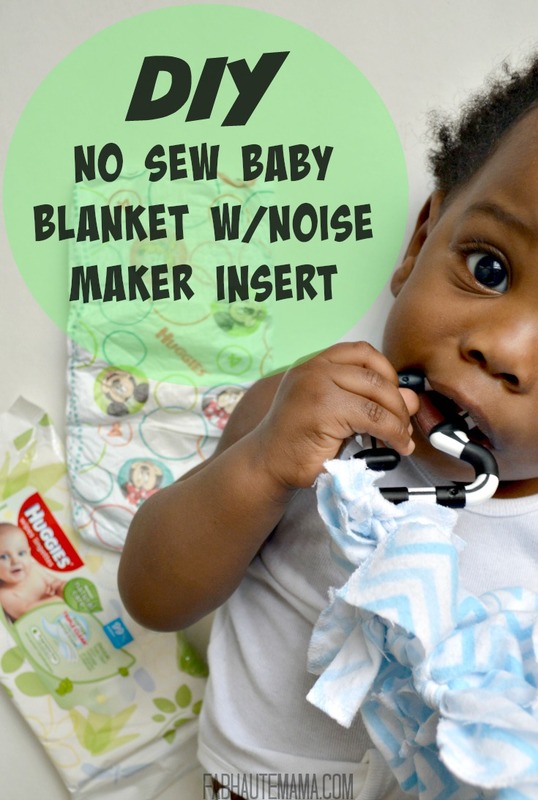 After trying all sorts of tricks including toys, singing, funny faces, tickles and all sorts of crazy sounds only kids can love, I decided to get creative and use one of his favorite things in a No Sew Baby Blanket… An empty wipes bag! Like almost every other baby I know, my son is fascinated by all things wipes. The wipes for sharpening his teeth massaging his gums, the coolness of the wipes, and the wipes bag because the noise is so much fun. Raise your hand if your busy little one is the same. And speaking of busy, wipes are one thing but this mama needs a serious champion diaper and she’s found it in Huggies Snug & Dry. You know because of the 12 hours of protection and all. My little guy still wakes up 1 time per night down from 3 times last month (hello WIN!) but I am not crazy. I will not wrestle with him or change his diaper during that time unless it is an urgent situation. So give me that up to 12 hours of protection from Huggies Snug & Dry, please. And then there is the whole shopping for diapers thing. How on Earth do people this little fill-up diapers so fast? Like how? So I go for the bulk box every time I shop at Sam’s Club which is all the time. 200 Huggies in one trip is glorious. Plus as a member, I save over $10 on each box I buy. 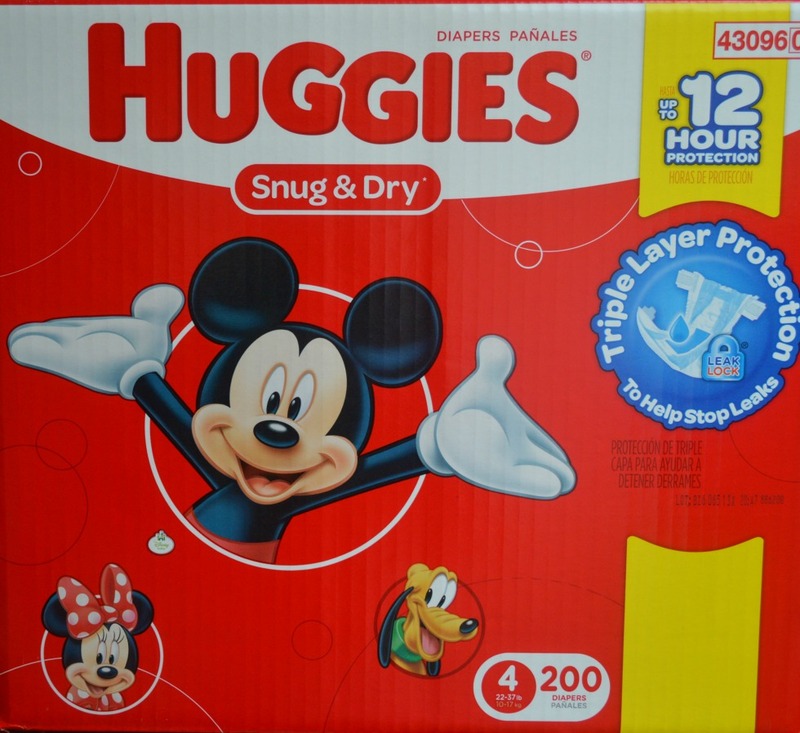 Sometimes I pick up two boxes especially when there is an additional savings offer which as of 3/9 there is a save $7 Ibotta offer on Huggies Snug & Dry at Sam’s Club. Grab your kiddos and go! Or maybe you have a sitter? If so, make a quick stop at your local Sam’s then keep going for some me time. It makes life so easy to shop for groceries and necessities in bulk for my kids and our household all in one shot. I grabbed two boxes, one of which is for a Just Because Mom & Baby gift basket I’m putting together that includes a must-have DIY No Sew Baby Blanket that is perfect for any little busy crawler, walker or wiggler. I keep Baby E’s on the changing table and only whip it out for diaper changes. It’s super easy to make and any mom will appreciate such a thoughtful gift. My Just Because basket is going to my son’s playdate friend and his mom. 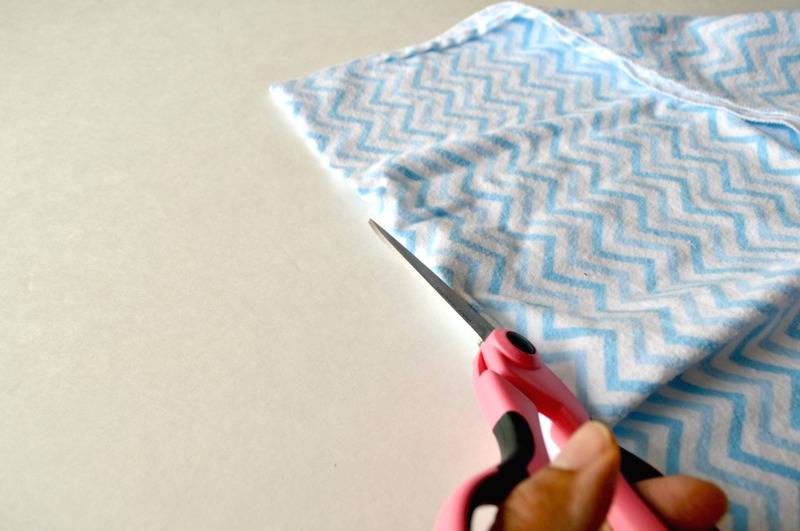 If you are using 1 large receiving blanket, fold it in half and cut it lengthwise. If you are using two blankets, make sure they are the same size and place one on top of the other. 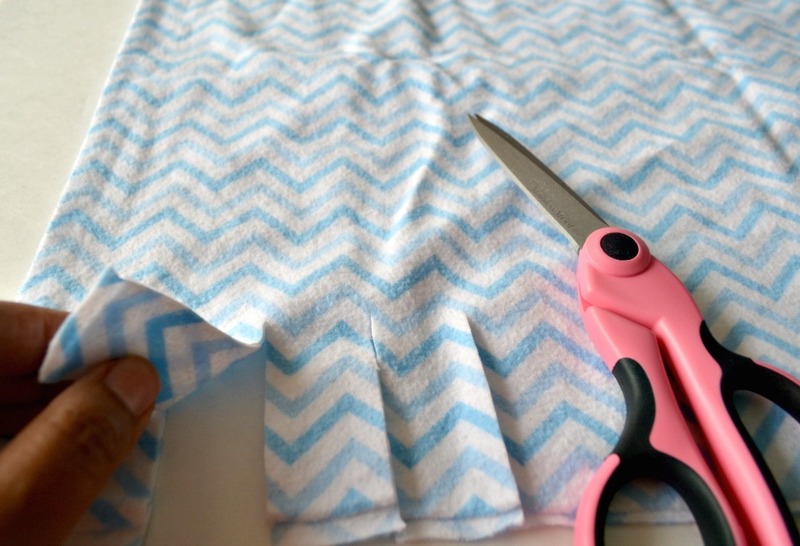 Cut 4-5 inch strips all around the blanket being careful not to separate the edges. 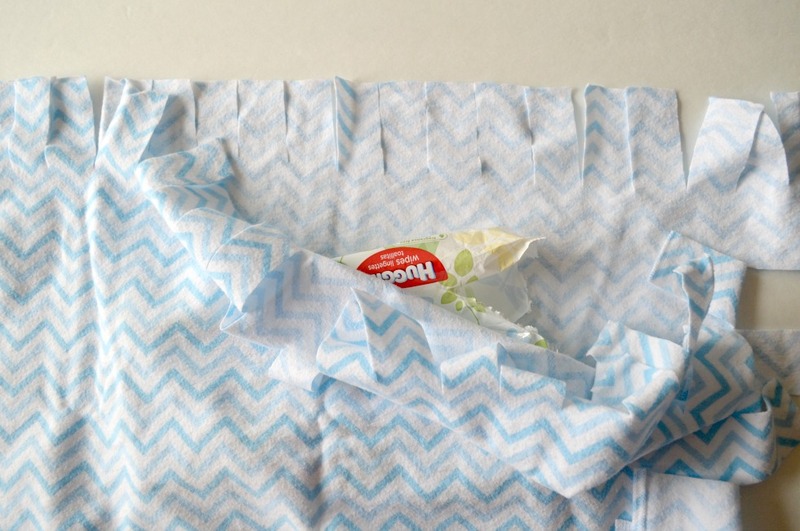 Once done with the strips, place your empty wipes package in between the two pieces. Start doubling knotting each set of strips all around the blanket. At the corners, you can tie two corners together to prevent a big gap. Attach teething toys or any other hand toy your baby loves. 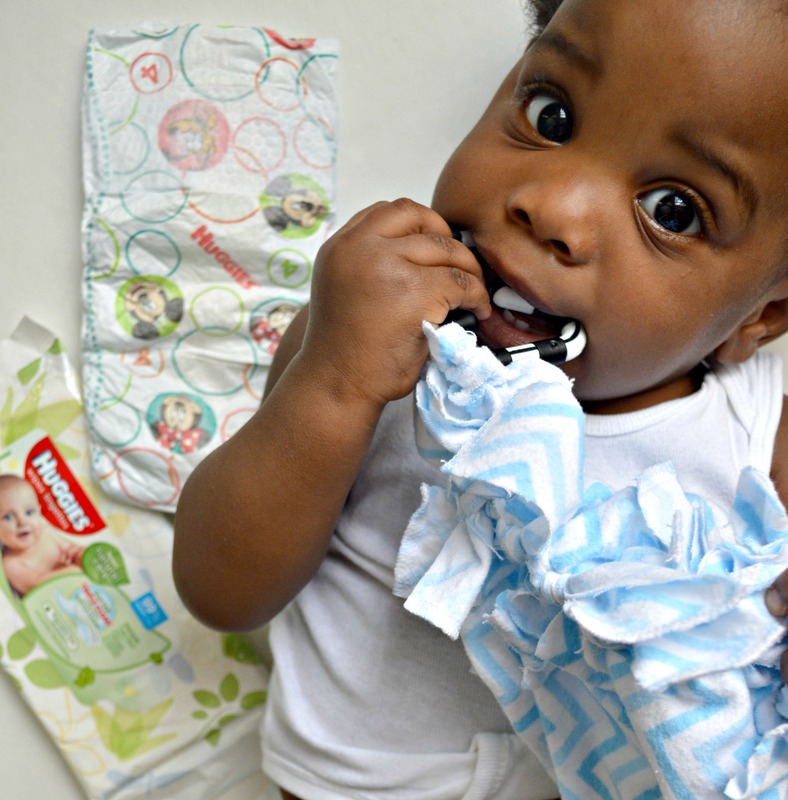 Test out the blanket during your baby’s next diaper change. 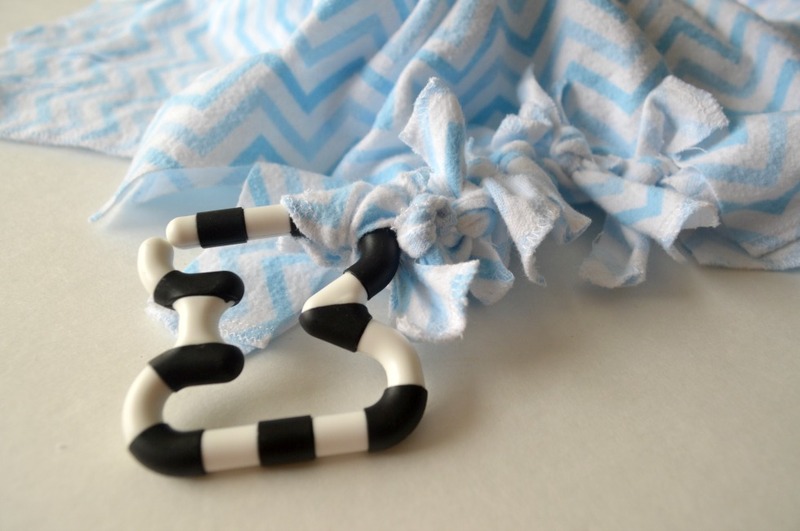 This blanket is easy to wash. Just untie the teething toys and open a few of the knots to remove the empty wipes packaging. Wash, dry and then put everything back in place. 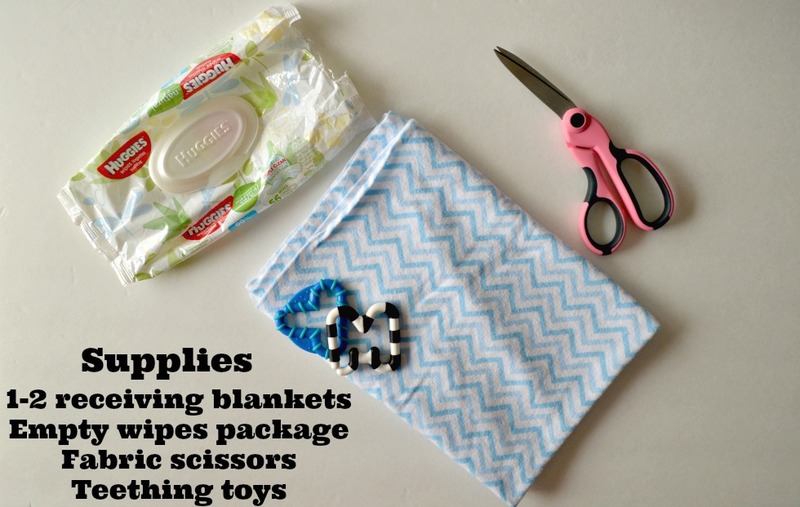 Add the DIY No Sew Baby Blanket to your new baby gift basket for the expecting mom in your life. Here’s a tip… all moms of babies (and tots) in diapers will appreciate a gift basket like this so customize it for their specific needs by adding the correct Huggies Snug & Dry diaper size to the basket. A travel kit of wipes is perfect for this gift basket and for outings. 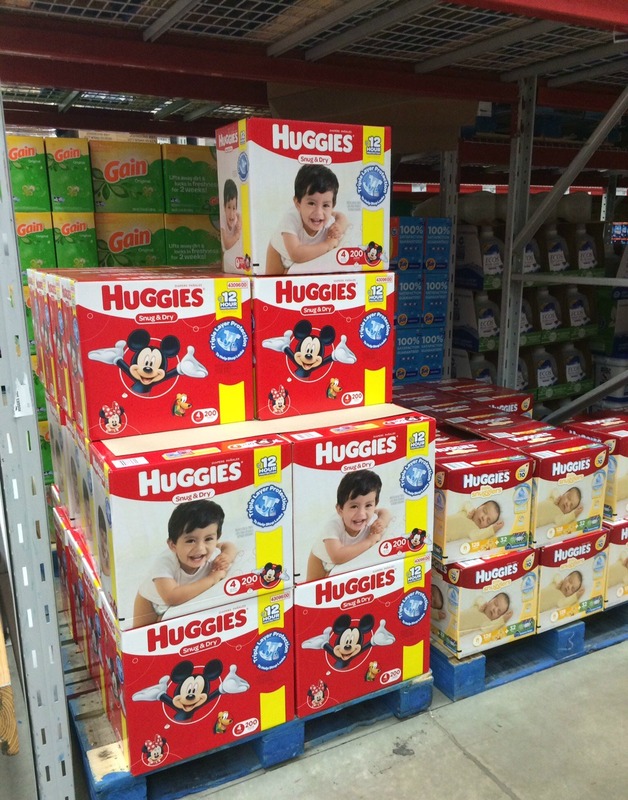 Make sure you head to Sam’s Club to save $10 on your next box of bulk Huggies Snug & Dry. You can find them in the baby care aisle. And don’t forget to redeem your $7 Ibotta offer.BTW… Ibotta is a budgeting mom’s best friend. What’s your favorite family items to buy in bulk? Oh and share your busy baby tricks with me in the comments too. This tired mama needs all the help she can get. 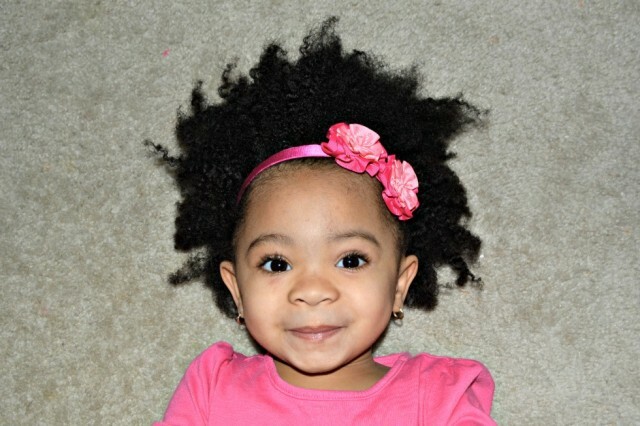 I’m just here for the cute baby! LOL. But this is such a great idea. I have had experiences with wiggling babies who are always trying to escape during diaper changes. I love this creative idea!! Such a great way to keep your little one occupied and it’s grewat for teething too-A Win-Win! 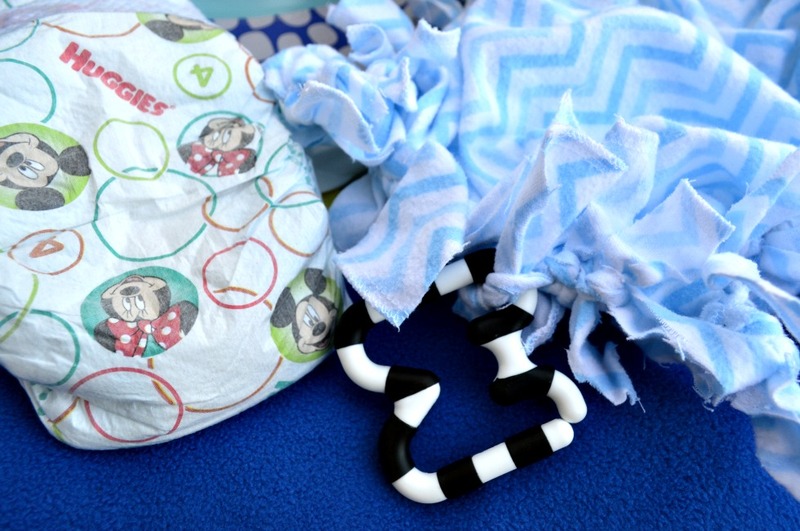 Yes Cathy, this little gem of a DIY has changed our diaper changing game.Litle does he know, that blanket is really for my sanity and not his entertainment. 2. This is a super cute idea. I’ve paid good money for plush toys that make noise. 3. My baby days are behind me but your son is so stinking cute. This is such a cute idea!! But you know I’m just here for my chocolate drop!!! He is so precious! This is such a clever idea and the blanket is so cute. Perfect for those who don’t see. Thank you Omi. It is definitely practical. 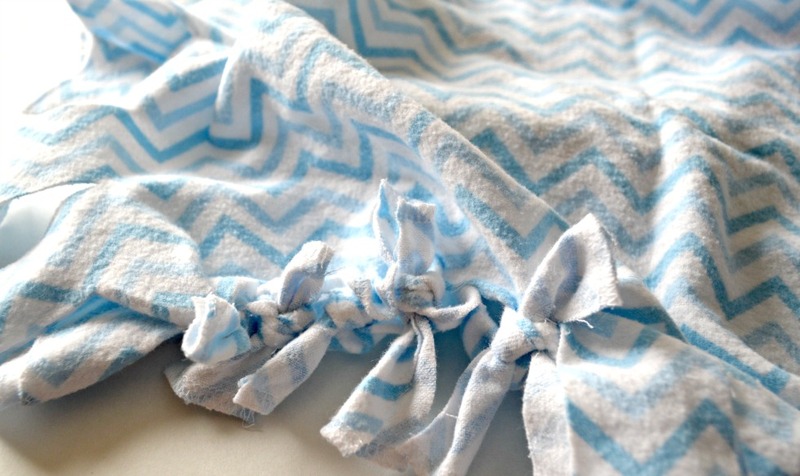 Thank you Fab Haute Mama and Baby E for DIY No Sew Baby Blanket post. Sounds like a Great idea to keep little one occupied while diaper is being changed.